The world is a small place until you look up into the sky and realise there’s a whole lot more space out there. I get lost looking at the clouds, especially when they look like this. I’ve submitted this for this week’s Photo Friday. 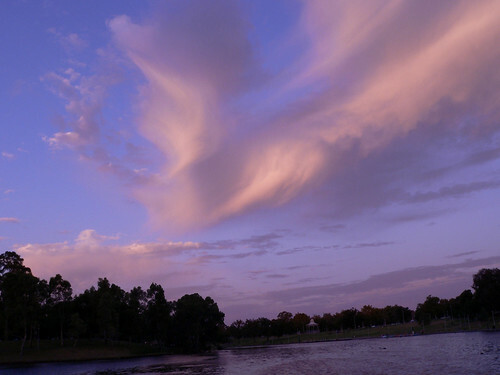 Whimsical, fluffy, other-worldly clouds can tempt and tease our imaginations for hours. Jayne, you’re right, clouds are a pick me up. It makes our problems seem quite insignificant – for a while anyway. Suze, my camera isn’t that flash but thanks for compliment anyway. We had that sky once! lol – beautiful shot! Beautiful photo Jen – looks like it . Happy birthday to JJ today and happy birthing day memories to you. Thanks for your belated wishes Joy. He did have a great birthday and is loving his Playstation so much that he tells everyone he talks to about it whether he knows them or not. We’ve been pretty good, and yes, very busy. Am off soon to a ladies lunch – yee hah!